The African nation’s top court rejected complaints by runner-up Martin Fayulu, who says the Dec. 30 vote result is fraudulent. Unofficial tallies say he is right. His supporters in Congo’s mining belt could now push for a split from Kinshasa – leaving cobalt supply in turmoil. 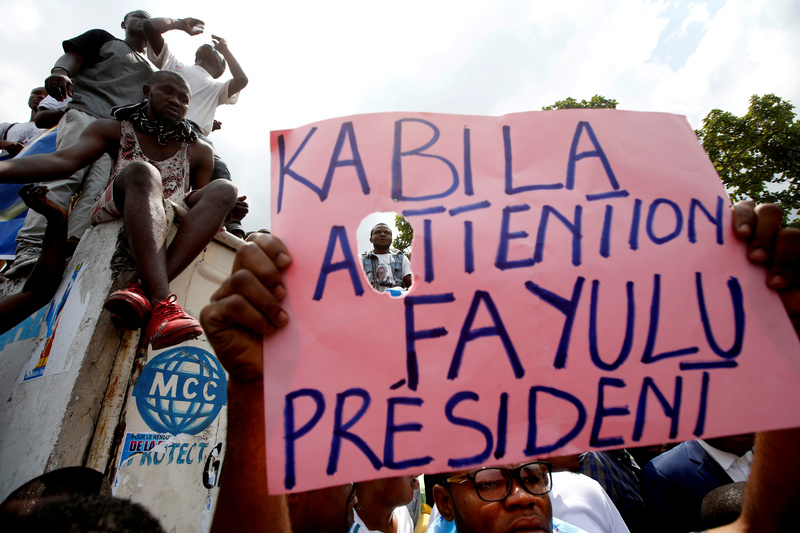 Supporters of the runner-up in Democratic Republic of Congo's presidential election, Martin Fayulu hold a sign before a political rally in Kinshasa, Democratic Republic of Congo, January 11, 2019. Democratic Republic of Congo’s top court affirmed the election victory of Felix Tshisekedi on Jan. 20, rejecting an appeal against the result by runner-up Martin Fayulu. Fayulu denounced the court’s decision as a “constitutional coup d’etat”, saying the official results of the Dec. 30 vote were fraudulent. In a Tweet to his followers, he urged them not to recognise the authority of Tshisekedi’s administration. Results tallied by Congo’s powerful Catholic church pointed to a Fayulu landslide. Poll results leaked to international media organisations, including Reuters and the Financial Times, corroborated the church’s findings.